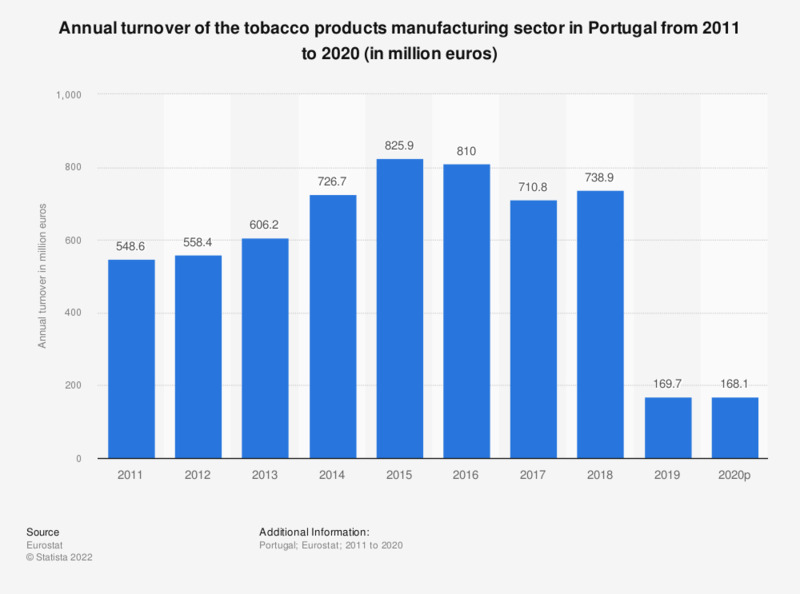 This statistic shows the annual turnover of the tobacco product manufacturing sector in Portugal from 2008 to 2015. In 2015, the Portuguese tobacco product manufacturing sector produced a turnover of approximately 825.9 million euros. The source adds the following information: "Turnover corresponds to market sales of goods or services supplied to third parties; it includes all duties and taxes on the goods or services invoiced by the unit with the exception of the VAT invoiced by the unit to its customer and other similar deductible taxes directly linked to turnover; it also includes all other charges (transport, packaging, etc.) passed on to the customer." Data coverage corresponds to Section C12 of NACE Rev 2.